The Reebok T 12.80 treadmill offers a 3.0 CHP motor and lots of handy features to keep you motivated during your workout. There is a high-resolution LCD Grafixx™ display with multiple information feeds for workout feedback. It has 28 pre-set workouts including aerobic, weight loss, and performance programs, plus 4 Create & Save™ Workouts. 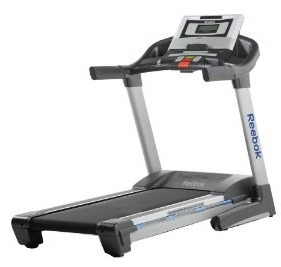 The Reebok T 12.80 treadmill is also compatible with iFit workout cards (sold separately). The Reebok T 12.80 treadmill features a 3.0 CHP commercial grade motor, 2.5" fully machined/balanced rollers, 12 mph top speed, 12% one-touch QuickIncline, a 350-lb user weight capacity, and large running deck with StrideFlex™ cushioning. The frame is identical to other ICON Fitness products such as the Epic and NordicTrack brands. Reviews on the Reebok T 12.80 are mixed. While it has received some good reviews, you wonder what they are comparing it to. Certainly not to other better quality treadmills sold at the same price. As for specifics – while the console frame on the Reebok T 12.80 is wide enough to hold a book or magazine, the display window is very small for important things like viewing your time, speed, distance, etc. The other disappoints on this machine: the AccuRate heart monitoring system is inaccurate, the speakers are tinny, and the customer service at Reebok is terrible so pray you never need to call them. There are no industry standards for rating treadmill motors so don’t be overly impressed by a listed 3.0 CHP motor. ICON Fitness does not use quality motors in Reebok, ProForm, Epic, and NordicTrack brand treadmills as compared to the cool-running low-RPM motors you will find in Sole treadmills. 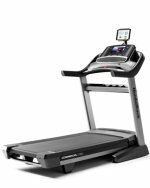 Reebok, which is not affiliated with the shoe company, only offers 3 or 4 treadmill models, and they have the same components and features as ProForm, Epic and NordicTrack machines – all built at the same factory in Utah. The MSRP on this model is $2,299 and sale priced at $1,130, but it isn’t worth it even at the lower price. There are better treadmills at even better prices than the Reebok T 12.80 treadmill.